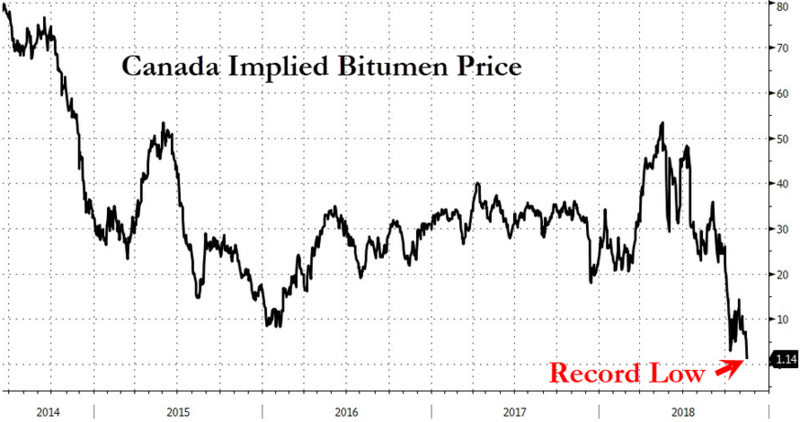 Canadian oil producers are in an increasingly tough predicament. With high and increasing oil demand around the globe over the last year, Canadian oil production has increased accordingly. All of this is simple and predictable economics, but now Canadian oil has hit a massive roadblock. Producers have the supply, and they have more than enough demand, but they don’t have the means to make the connection. Canadian export pipelines simply don’t have the capacity to keep up with either the supply or the demand. Now, adding to the problem, growth in oil demand has begun to slow in the wake of skyrocketing United States production and the weakening of U.S.-imposed sanctions on Iranian oil. First, the U.S. granted waivers to eight nations to continue buying Iranian oil despite strong rhetoric, and now the European Union has undermined the sanctions even further. The massive Keystone XL pipeline project from TransCanada Corp. was going to be a major move in the right direction for the Canadian oil industry, adding much-needed capacity to the network. Keystone XL would add 830,000 barrels of daily shipping capacity — approximately 4.2 percent of total U.S. oil demand — by 2021. Now, in yet another bit of bad news, it looks like Canada won’t be able to count on Keystone XL as a saving grace after all, as a Montana federal judge recently ruled to further delay the pipeline at what is easily the worst possible time for the industry. Last Thursday’s ruling for an additional environmental review is just the latest setback in a decade-long legacy full of roadblocks for the controversial Keystone XL pipeline. The huge project would construct a 1,179-mile long pipeline for the purpose of delivering Canadian crude from Alberta’s oil sands to a Nebraska junction, from where it would continue its transnational journey all the way to refineries near the Gulf of Mexico. The pipeline was plagued with lawsuits since its inception and has recently seen new waves of litigation since President Donald Trump announced his approval for Keystone XL to cross the U.S.-Canada border in early 2017. At that time, two separate lawsuits challenging the project were filed by the Indigenous Environmental Network, River Alliance and Northern Plains Resource Council, which resulted in last week’s ruling that prohibits both TransCanada and the U.S. government from “from engaging in any activity in furtherance of the construction or operation of Keystone and associated facilities” until the U.S. State Department carries out a supplemental review.